Lack of snow condition was same in Italy, recently we find snow machine in Lago Lavaze. This ski race was more big number of skiers about 400 skiers several years ago, this winter was normal size race with 210skiers. Temperature was minus 10 degree at the start, after sunshine coming temperature was up to nearly 0 degree, no wind no cloud, sunshine nice race day!! 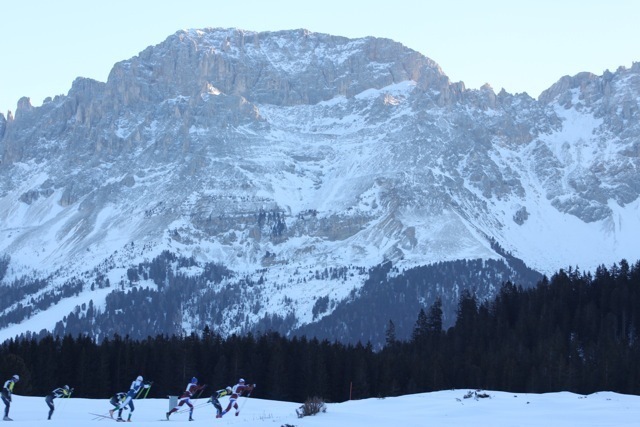 We enjoyed beautiful Dolomiten Mountains during the ski race. Snow condition was well, classic course was groomed well and hard. Net distance was 19 km. De Martin Topranin Virgin (ITA) 52:19 (WOMEN). From this year Marcialonga logo was changed to a new simple design. Snow condition was same lack of snow, but ski course was already well groomed one week before the race, perfect condition of Long White Snake!! On the race day temperature was minus 5 degree at the start, no wind, it was wonderful day for the race. 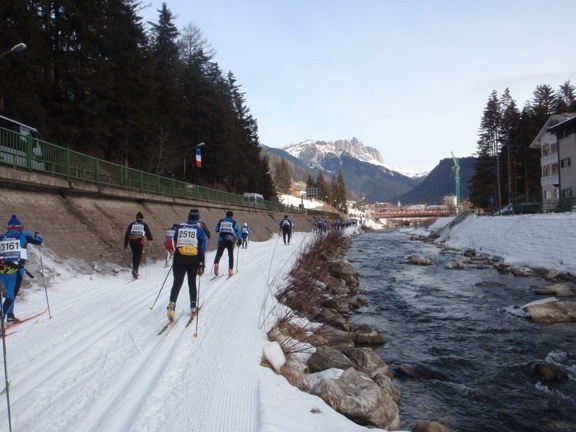 7200 skiers started Moena to the finish in Cavalese. From Moena to Canazei there is no stressful point with ideal starting system and good grip for gentle ascending course, but after Canazei course change to descending but we need more effort and time to glide. One Norwegian skier told to me today’s snow was ski eating snow, it was difficult to ski, tough race today. After the race very beautiful and fantastic fire works celebrated all finishers. it is a shame that the Marcialonga has gone against the world loppet rules and regulations and presold race spots for the 2013 race. As international skiers we got up at 1:00 am to register and found out it had already been sold out. How could over 6,000 spots be sold out in that short of time. Heard that spots were sold to tour companies. Shame on the race. We had to book flights, accomodations, hotels, etc in July to make sure we were guaranteed getting over there and had places to stay. The Marcialonga organization said too bad we did that before we knew we got in to the race. We repeatedly contacted them over the summer and fall to find out when registration would open. So there we were us Candians all up at 1 am to find out all the spots were taken. Leaves a bad taste in our mouths. every 2 yrs we have been coming to Europe to do a world loppet and this is what happened this year.